Wolfgang Fink has always had a knack for seeing how the pieces of a puzzle fit together. Once, when a team of researchers at NASA's Jet Propulsion Laboratory was stumped on how to fix a problematic planetary rover arm, he suggested using a method he'd developed to improve the function of proteins, pointing out something no one had thought of before: Both robot arms and proteins have joints. It worked. Today, it means that the electrical and computer engineering professor — who has joint appointments in biomedical engineering, ophthalmology and vision science, systems and industrial engineering, and aerospace and mechanical engineering — can continue finding connections across disciplines to solve a world of problems. "People always think I'm spread thin, but it's not like that, because I have tons of fields, and they all fit together," Fink said. "There's this horrible saying — 'Jack of all trades, master of none' — and I just don't believe that has to be true." Fink's latest accomplishment is really a series of accomplishments, all related to the Prognostics and Health Management, or PHM, Society. 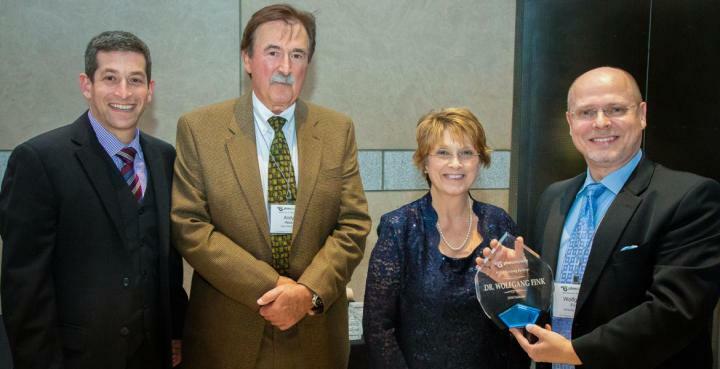 Not only did the society recently induct the UA Edward & Maria Keonjian Endowed Chair as a fellow — an honor only achieved by a maximum of five people each year — but it also selected him as a guest editor for a special volume of its journal on predictive health management and as general conference co-chair for the society's 2019 conference in Scottsdale, Arizona. The society also named him a sector lead for the area of "human asset health and performance," which makes him a nonvoting member of the society's board of directors. "Wolfgang is one of the most intelligent, energetic and broadly knowledgeable professionals that I have had the privilege of working with," said Andy Hess, PHM Society president and one of Fink's nominators for the award. "These traits, coupled with his experience and seemingly endless energy, were what led the PHM Society to award him by inducting him as a fellow." Fink's current work is focused on predictive health management, a field with an origin in aerospace engineering but, in fittingly Fink style, with wide-ranging applications. In lay terms, predictive health management is simply preventative maintenance. Rather than wait for some element of an aircraft to fail while it's in operation, engineers use models to predict what parts of a design might fail, when and why. Then technicians replace the parts with brand new ones — well before the original parts actually stop working. It turns out, airplanes are just the tip of the iceberg when it comes to applications for predictive health management. In fact, Fink says it's a near-omnipresent theme. For example, humans already take preventative health measures, such as eating healthy foods, exercising and getting enough sleep. But what if researchers and physicians could team up to take the ability to predict health outcomes a step further? "We are, in a way, very complex machines — more complex than machines," said Fink, who leads the Center for Informatics and Telehealth in Medicine, or InTelMed, a partnership between the UA, industry and professional bodies such as the PHM Society. "What we're trying to do is gather data on patients and use it to make a prognosis as to where a patient is headed. Is a patient on the verge of developing prediabetes? Or having some sort of heart rhythm distortion that may point to heart problems or a stroke in the future? Can we suggest countermeasures early on to prevent these things from actually happening?" This research into preventative health maintenance for humans is starting in one of the areas where it's both most crucial and most complicated, where humans with lots of special training — who are therefore difficult to replace — need to stay healthy because they can't access a doctor: outer space. "Once you're in space flight to the moon or to Mars, with potential settlement on both, a quick return is not an option," Fink said. "You try to discover very early on that you may be coming down with a cold, and immediately hammer it with an antibiotic." Developing these systems requires some complicated engineering: Not only do researchers need to constantly monitor astronauts' vitals, but they need to use predictive modeling to determine exactly what today's vitals could mean for tomorrow's health. Then, a system must translate these complex medical statistics into information the astronauts can use. "We're talking about providing an astronaut a tablet that takes all of their complex data and comes up with simple recommendations, like 'you need an aspirin,'" Fink said. For Fink, the sky — or rather the reaches of outer space beyond it — is not the limit. If engineers can perfect these predictive methods in space, then using them to monitor human health on Earth should be easy. From there, why not use it to plot the health of the crops on Earth that sustain human life? As one of the founding members of the Mars Agricultural Research Consortium, or MARSAG, Fink is a part of developing techniques to grow plants in Martian greenhouses. "Just like in 'The Martian,' if you manage to grow a plant on Mars, you can grow it anywhere on Earth," he said. "If we solve it for Mars, or in the wake of developing technologies which are applicable to Mars, we have made huge strides on Earth for precision agriculture and human health."